Most people probably visit San Diego to do lazy things. Sunbathe by the beach. See caged animals at the popular zoo. Maybe visit Legoland. I’m not judging—depending on your vacation values, all of those could be worthwhile pastimes. But there’s another side of San Diego I hadn’t fully considered until my third, and most recent, visit. That is the more adventurous, smile-inducing side. And unlike the rest of Southern California, San Diego is noticeably friendlier and a little more affordable. Don’t get me wrong. I consider Los Angeles one of America’s greatest cities. Way better than New York, in fact. But Los Angeles is to San Diego what Miami is to Fort Lauderdale. By that I mean San Diego is less pretentious, more friendly and easier on your wallet. You’ll still pay the California weather tax here. But after visiting, it’s easy to see why Money Magazine named San Diego the best domestic travel destination. That goes for food and lodging as much as it does attractions. Because it’s one of the best snorkeling spots in mainland America, you really need to bring a snorkel kit and head to La Jolla Cove. At the rocky beach in front of my hotel I saw lobsters, garibaldi and several other unidentified specimens. And because La Jolla Shores is one of the best spots for beginner surfing, I highly recommend the non-bro-ish and welcoming nature of SurfDiva. Even if you don’t need a lesson, you can rent one of their surf or paddleboards and still rip it. 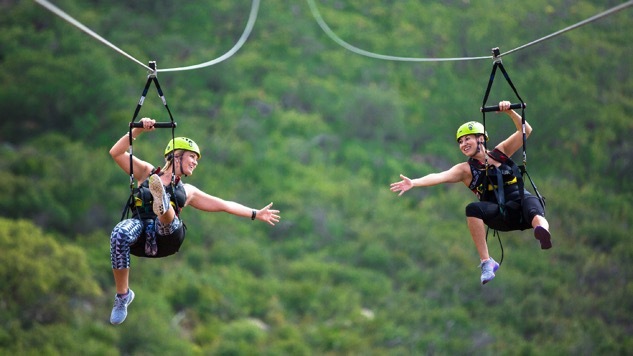 Other than that, La Jolla Ziplines is a fun ride but a three-hour roundtrip drive away. Outside of catching some righteous waves, Torrey Pines Paragliding was the highlight of my trip. It was the first time I ran off a 300 foot cliff only to be saved gusting and exhilarating wind. Oh, mamma—where to begin. I really enjoyed San Diego’s take on seafood, brunch, and Tex-Mex. For the former, head to Dukes La Jolla for caramelized pineapple sashimi, Maui onion muscles, eggplant miso, macadamia fudge sundaes, Portuguese donuts with guava jam and patio sunsets. Or head to George’s Ocean Terrace for even better service and sashimi. At Breakfast Republic in Liberty Station, I enjoyed the steak and eggs and churro pancakes with raspberry sauce. At Galaxy Taco, I overate on street corn, shrimp, fish and avocado tacos. And at Yogurt Your Way, I completed my sun-bleached adventure with a remarkable watermelon sorbet. The short answer: La Jolla. It’s right in the heart of what most people consider “the nicest place in town.” And you’d be hard-pressed to find more reasonable quality than The Grand Colonial. Watching a meteor split the sky over the ocean, gawking at crowds of locals hunting for Pokemon on their phones while next to one of America’s greatest coastal views and meeting a naturalized paragliding pilot who achieved the American Dream after arriving in this country with only $70 and a parachute. Kayak spearfishing because stupid El Nino blew out all of the kelp forests last winter, and the new indoor skydiving tunnel because I didn’t know about it until after. I’ll be back.